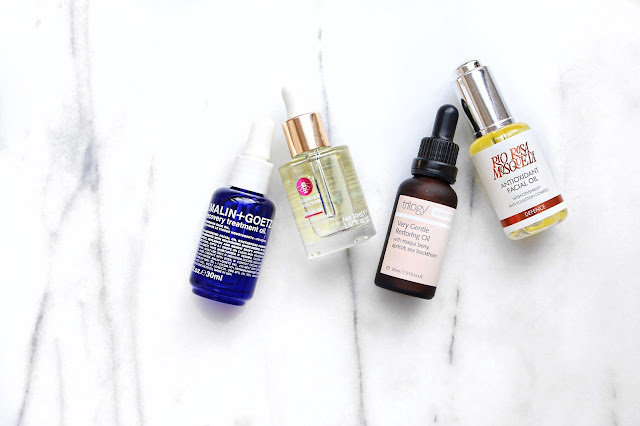 Facial oils are the unsung heroes of skincare. Whatever your skin type and problem is, facial oils are guaranteed to serve you up the solution you've been searching for. It's a common misconception that oily skinned girls like myself should steer clear of anything that hasn't got 'matifying' plastered all over its label but oils are perfectly suitable and damned right effective for any and all skin type. They're unbelievable at re-hydrating a complexion, which in turn contributes to anti-ageing and making your skin appear brighter and more radiant. They also help to even out skin tone, blurring out imperfections such as dark spots. And for the ladies who suffer with oily skin, who are flat out reeling at the thought of putting oil on their face - these beauties balance and prevent your skin from overproducing oil by giving it the hydrating that it naturally needs. If I had to choose one oil to commit to for the rest of my life - it would be this one. I adore this oil for every day use and I prefer to apply this underneath my makeup during my morning skincare routine rather than of an evening as it's lightweight enough. This lush Mauka Doctor product gives my complexion a heavenly radiance which I absolutely adore and also brings in plenty of compliments - TYSM. The sensitive skin counterpart of the cult Trilogy Rosehip Oil, this product has super sensitive skin in mind and ingredients that nourish and protect it. If my skin is having an episode and I am tentative about putting anything to heavy on it, this is what I reach for. The ingredient that I am doing major heart eye emojis at is sea buckthorn, which is a dream for softening wrinkles and also does wonders for stretch marks. First things first, this smells divine. I'm full on obsessed with the beautiful scent of this product. Not only does it smell gorgeous, but it also looks stunning. Peep that silver and rose gold packaging, could my Instagram feed ask for anything better?! Luckily, this product doesn't just have a pretty face, the oil itself is amazing. It leaves me absolutely glowing and makes my skin feel so treated. For me, this is a tad too oily for me to wear under makeup, so this is my go-to for an overnight complexion pamper. If you are an extremely oily gal or guy and are cringing at the idea of the feel of oil on your face, this is the choice for you. I find this the most lightweight and invisible looking and feeling oil in my arsenal and gives my skin a super soft, naturally hydrated feel. This makes it great for every day use and this lovely product is a heaven sent for all skin types.